Gold Coast Cruise Parking Is a well established Fort Lauderdale Port - Port Everglades parking operator offering friendly service for Port Everglades Cruise Parking, they will do everything possible to help make both the beginning and end of your trip as easy and hassle free as possible. they provide professional and courteous valets that drive you in their air conditioned shuttles directly to your terminal AND even unload your bags for you. And when you return, we’ll have your car cooled down and ready for you to drive off, complete with your receipt. Arrive at Gold Coast and one of our friendly shuttle drivers will assist you with your luggage. Our office is open from 5AM-12AM. However, our drivers are available 24 hours a day for our on demand shuttle service. When you arrive at Gold Coast check in with your receipt or by name or reservation number and one of their friendly shuttle drivers will assist you with your luggage. they will quickly shuttle you straight to your cruise ship, and when you return from your trip, simply call us 1.800.421.8752 or 1.954.522.0665 and they will come pick you up in their air conditioned shuttle. See Parking Rate And Tax Information Below. One of their friendly shuttle drivers will assist you with your luggage & quickly shuttle you to your cruise ship. Shuttle drivers were great / our car was ready and waiting / your easy in and out location = an outstanding experience!. Super service from beginning to end ! congrats on your great customer relations ! Great location, wonderful staff and excellent service. Gold Coast Cruise Parking is a great parking lot. I never thought it would be possible to find parking like this anywhere close to the airport but boy was I wrong! I only needed to park my car for the long weekend but it was completely worth it! Thanks so much for the great service! Gold Coast Cruise Parking gets a five-star rating! I came back to find my car in the exact spot I left it and there wasn't a thing wrong with it. You need to check them out! Gold Coast Cruise Parking is the only place that I will park my car from now on when I am headed out on vacation. The facility is clean, the shuttles are fast and the staff is the best I've ever worked with. I had to park my car for almost 4 weeks while I was away on a business trip and knew that leaving it at home on the street wasn't going to work out well. I needed it to be close to where I was going to be when I came home o that I would have a way there. I also wanted my car to be in a secure area so that it would be safe while I was away. Gold Coast Cruise Parking did a great job, everything was intact when I returned. Highly recommend! I have no complaints whatsoever. Gold Coast Cruise Parking was great, the staff went out of their way to ensure that we were happy with everything and that we got on the shuttle in a timely manner. Thank you so much for your excellent customer care. We will be back again soon. Awesome, amazing, wonderful and fabulous is how I would describe my experience with Gold Coast Cruise Parking. They care about you and want you to be happy with the service that they provide. I needed to find something that was convenient for parking my car long-term when I was planning my trip. When I found Gold Coast Cruise Parking I knew it would be a good fit because they are literally around the corner from Port Everglades. So happy with this experience! Thanks again! Gold Coast Cruise Parking always provides great service and is the easiest part of my trip because they are so helpful with loading and unloading my luggage. Highly recommend to anyone looking for a company that is going to take good care of them. Everything at Gold Coast Cruise Parking was exactly as it was advertised. There aren't any added frills but for the price, it's what you would expect. Parking at the Gold Coast Cruise Parking was decent. The only problem that we encountered what that we did have to wait a bit for a shuttle to pick us up from the airport when we arrived home. We probably should have jumped in an Uber to get back to the parking lot, it would have been much faster. When I literally stumbled upon this parking lot I knew that I had found a good one! I was driving by and saw the big sign on their lot. The staff at Gold Coast Cruise Parking are unreal! They take care of you completely and make sure that your vacation had a great beginning! My best advice for you is to book early because Gold Coast Cruise Parking is so good at what they do and offer that you will often see that they book up completely. Thanks so much for the continued excellent service! Unfortunately, I had to cancel my reservation with Gold Coast Cruise Parking that I had made online because we had a family emergency. I still think that they deserve 5 stars because of how well the dealt with the entire situation. The lady that I spoke with was very understanding and told me to expect to see the credit on my MasterCard in 5 to 7 days. Thanks so much for your understanding! Shuttle bus between the airport and Gold Coast Cruise Parking was fast, efficient, clean and could hold a decent amount of people. We will use them again every time. Gold Coast Cruise Parking has some of the nicest people I've ever dealt with in customer service. No matter what you read this is a cheap parking lot you only ever pay discounted prices here. Traveling is expensive enough that when I realized I hadn't thought about parking I became really stress out because it's typically so expensive, but not with Gold Coast Cruise Parking! Their rates are VERY reasonable, some may even call them cheap. The best service I've ever received! I would 1000% recommend that you check them out for your next long-term parking needs. Gold Coast is great! I've been using them when I travel for over 10 years now. I highly recommend them for both airport and cruise port parking. They will save you a lot of money and some time too. Gold Coast Cruise Parking is great. Adam helped us to get check in and then sent us to a restaurant that he recommend since we were hours early. He was right it was a great restaurant! Thanks so much for your help Adam and for helping us to relax and enjoy ourselves! Gold Coast Cruise Parking is sic! I decided to park here when we were driving around the airport and saw that these guys were way cheaper than if we decided to park in airport parking instead. These guys really know how to take care of their customers, they treated us like we were real ballers. Gold Coast Cruise Parking is cheap while still offering the best of the best. The staff at Gold Coast are compassionate and friendly. They will take care of you and your car so that you don't have to worry about it while you're away on vacation. You only worry will be that you actually relax while you're away. Gold Coast is the only parking lot in the area that gives 110% to everything that they do. This company will take care of you from start to finish. Using Gold Coast Cruise Parking is a far better alternative than the airport or the cruise port. Let someone else help you to get our vacation off on the right foot, that's what the staff at Gold Coast will do for you. No one wants to have to cart their luggage out of their car and half way across the airport struggling the entire time. Plus don't forget if you park at the airport for the entire time of your vacation it's going to cost you a lot of money. Instead, check out Gold Coast Cruise Parking, they will take care of you from the minute you drive into the lot. The daily rate at Gold Coast Cruise Parking is far better than parking at the airport or Port Everglade itself. Save some money and let someone else take care of the annoyances of parking your care and dealing with your luggage. Making a reservation for Gold Coast Cruise Parking online is easy and makes the entire check-in process much faster. All you need to do is show your reservation and you'll be on your way. 100% recommend this lot to everyone! Simply wonderful overall experience with Gold Coast Cruise Parking! No complaints at all. Worth parking here for sure. The parking at Gold Coast Cruise Parking was cheap and in a perfect location. Only minutes from the cruise port and the airport make this parking lot ideal for anyone who is traveling that needs a place to park their car. Check it out, you won't be disappointed! Making my reservation for Gold Coast Cruise Parking online was so easy. It was free to do and cancellations are accepted up until 24 hours ahead of time. Great experience, I would book and use Gold Coast again. I knew when I pulled into the Gold Coast Cruise Parking lot that my car would be safe. There were lights all around the lot and security too. Great lot, with great people! I felt comfortable leaving my car at Gold Coast Cruise Parking. The lot has staff working 24 hours a day so it doesn't matter what time you're leaving for your trip. I appreciated the folks at Gold Coast Cruise Parking because they were upfront with me right from the start about the extra fees that they had to charge according to the state. I really respect that they told me all of this before I left on my trip so that I wasn't shocked by my bill. Not that I would because the cost per day is so low. Gold Coast Cruise Parking is easy to find and is far cheaper than airport and cruise port rates. My neighbor suggested that I give Gold Coast Cruise Parking a shot when I told her that I was going on a cruise. So glad that I listened to her, it was the best experience I've had yet with any long-term parking that I've used before. Every time I park at Gold Coast Cruise Parking I have the best experience. These guys are the bomb. Close to where I need to know, these guys know where it's at. I'm glad I decided to give Gold Coast Cruise Parking a chance. This parking lot is awesome. The shuttle drivers are all friendly and insist that they put your luggage in the shuttle for you. Everything is quick with no or very little waiting for someone to get you where you need to go. I particularly like that Gold Coast Cruise Parking is a small business that is run by a family. It makes you feel like you're at home. Consider me a regular from now on when I'm flying or going on a cruise. Such great people that run Gold Coast Cruise Parking and it's CHEAP too! Love it! Great customer service all around! The Gold Coast Cruise Parking lot is in a great location, just around the corner from Port Everglades and close to the airport as well. The shuttle for real only took a few minutes each way. Love this place! I have a trip coming up again in a few months and intend to use Gold Coast Cruise Parking again. This family-owned business is well run and the staff are very friendly helpful and organized. Just around the corner from Port Everglades which makes it the best choice to park your car by far. Gold Coast Cruise Parking is a great lot that's so close to the cruise port. I've already told several people about my experiences with them and recommended that for their next vacation they use the guys. A great experience overall, I've got no complaints. It's clear that the staff at Gold Coast Cruise Parking lot work hard to make sure that all of their customers are happy. Gold Coast Cruise Parking lot is a great lot! It's REALLY close to Port Everglades which is why I choose to park in this lot. I got there quickly and was able to get on the cruise ship with tons of time to spare. Thanks so much to the staff at Gold Coast Cruise Parking. They went out of their way to make sure that the start of my vacation went smoothly and without any problems. The shuttle dropped me at the cruise port early so that I could get onboard with time to spare. I will be using Gold Coast again for my next trip. I was so grateful for the shuttle driver at Gold Coast Cruise Parking who pointed out that I had left one of my bags in my car when he was helping me to load everything into the shuttle. I would have had a terrible vacation had I actually forgot it. Thanks so much for being observant and caring. Highly recommend this company if you're looking for somewhere to park your car while you're away on vacation. The staff at Gold Coast Cruise Parking was more than accommodating and willing to go that extra mile to make my experience a good one. I will use this company again in the future. I have to say that I was really impressed with how organized and competent the staff at Gold Coast Cruise Parking was. I felt absolutely comfortable leaving my car in their lot while I was away on my cruise. Thanks so much for looking after me, I really appreciate it! Gold Coast Cruise Parking is located just around the corner from Port Everglades cruise port. It was super easy to register my car at the front desk. Everyone that I spoke with was great! They explained the process to me and what I needed to do to get picked up from the port upon my return. I left feeling like my car would be safe and sound the entire time I was on vacation. Gold Coast Cruise Parking was okay. I would say that the reason they only got 3 stars is because they did what they said they were going to but I didn't feel like they went above and beyond to make them really stand out. It was easy peasy to make a reservation online for Gold Coast Cruise Parking. Everything on the website is clear and a cinch to follow! Will definitely be using these guys in the future. The daily rate at Gold Coast Cruise Parking is great! It's cheap and the family that runs the place is willing to help you with everything that you're going to need to safely and securely store your car for an extended period of time. I've never had a lot of luck with long-term parking lots when I've traveled in the past so I was very cautious about what company I was going to chose to leave my car at this time but Gold Coast Cruise Parking really did what they said they were going to do: protect my car and protect! Will only use these guys from now on. Everything while parking at Gold Coast Cruise Parking was okay. Nothing really special or that stood out. Sure it was close to the cruise port, but that's why I booked it. I'd use them again to park my car. I'd rate Gold Coast Cruise Parking more than 5 stars if I was given the chance. The family that owns and operates this facility is wonderful to work with. Strongly encourage you to check it out for yourself. I have already told some of my friends and family that they need to give Gold Coast Cruise Parking because of just how great my experience was. Everything went so well that I've been telling it as part of my vacation story which is not typically something that I do. Since I am someone who travels a lot it is important to me to have a long-term parking facility with staff that I can trust to take care of my car and make sure that it is in the exact condition when I return from my trip. With Gold Coast Cruise Parking it's easy to put your faith in them because they will deliver. It's true that Gold Coast Cruise Parking aims to make sure that the beginning and the end of your vacation is as hassle-free as possible. You don't have to worry about any of the stresses that come with parking your own car at Port Everglades or at the airport because they do all the work for you. I can see why they are still in business! Gold Coast Cruise Parking is family owned and operated and you can tell because they care about you like you were part of their family not just another dollar sign to them. Highly, highly, highly recommend to anyone who needs to park their car long term while away on vacation. Absolutely amazing experience! It's great how close to the port Gold Coast Cruise Parking actually is, far closer than I thought, that's for sure. We will definitely use this facility again! Gold Coast Cruise Parking is great! A few of the employees could be a bit more friendly and helpful when you're trying to park but otherwise a good overall experience. I will use them again in the future. Love these guys at Gold Coast Cruise Parking! The check-in was quick, the shuttle driver was waiting for me to take me the short distance to the Everglades cruise port. The trip back to my car was just as great too. I was met at the port by the shuttle driver without having to call for a ride and then we were back in the lot and I was loaded up and on my way home before I knew it. Even though the office hours aren't 24 hours it really doesn't matter as long as you have your receipt, valid ID or a reservation number the shuttle drivers will take care of you. They will see to it that you arrive at the Port Everglades with plenty of time to spare too! Highly recommend Gold Coast Cruise Parking! I would park at Gold Coast Cruise Parking again without a second thought because our first experience was so good. will recommend to friends who are traveling in the area. Really impressed with how the shuttle driver handled the traffic jam caused by an accident just in front of us. He got us to the cruise port with time to spare and was polite and helpful the entire time. We will use Gold Coast Cruise Parking to park our car the next time we travel. Everything was great with Gold Coast Cruise Parking! I will now be a regular user of their services. Thanks for looking after me and my car. I was glad I didn't have to manuver the traffic around the piers, and my car was in a secured lot. I was so focused on getting on our cruise, I didn't think to ask where to meet the driver when we returned. This was my first time using Gold Coast Cruise Parking and I can tell you that I was very surprised and happy with everything! The shuttle bus driver was prompt and just great overall. I look forward all aspects of traveling again knowing that my car will be safe as well. For sure the price is what attracted me to Gold Coast Cruise Parking but I had a great experience from the drop off to the pick up at the cruise port to the check out when we returned to the lot. These guys know what they're doing and they're good at it too! Strongly recommend this parking lot to others. I was a bit stressed out about leaving my car somewhere for an extended period of time when I didn't know the place but when I arrived at Gold Coast Cruise Parking my mind was quickly put at ease. Everyone answered my questions, they were all friendly and very kind. Once I stepped into the office I knew that everything would be fine. We will use your facility again. It was really easy to find Gold Coast Cruise Parking when I was headed there to park for the week so I could go on vacation with my sister. No wait times for shuttles either way and our drivers were great! Everything was great from start to finish at Gold Coast Cruise Parking. Thanks for taking such great care of us and getting us to and from the Port Everglades cruise port with no problems. We will recommend this lot to everyone we know! In my opinion, it's important that the parking lot is clean and that it's clear that it's well maintained, no matter how cheap it is to actually park there. Gold Coast Cruise Parking is in great shape, it's obvious that everyone who works there takes pride in their job and the customer's cars. This parking facility is great! When you arrive at Gold Coast you can easily check in with your receipt, your name or reservation number. Once checked in a shuttle driver will help you with your bags and then you will be on your way to your cruise ship. After reading a bunch of reviews we decided to use Gold Coast Cruise Parking. So glad that we did! Everything went off without a single problem and everyone in my group was happy. We will definately use them again! Pick up was quick both ways with Gold Coast Cruise Parking. Our car was already running and cooling down inside and the trunk was open waiting for our bags. Great service from start to finish, time for you to give them a shot! My car was returned to me with $2000 worth of damage to it and the lot did everything in their power to try and convince me that it had been damaged when I left it with them. Awesome company and facility too! Less than 5 minutes from the Port Everglades. Totally amazing company we will use them again for sure! Stellar family who owns the place and they know how to take care of their customers at Gold Coast Cruise Parking! Thanks guys for helping to make our vacation a great one! Everything went perfectly except, anxiety set in when we arrived and no one was on sight. A few minutes later, someone showed up. Top notch service and it's so close to the Port Everglades! I love this company so much! I've chosen some bad long term parking before but this time Gold Coast Cruise Parking really came through! Super happy customer here! Thanks so much everyone! This was the first time we had planned to drive our car to the cruise ourselves and then catch a shuttle from a parking place nearby. That's when I spotted Gold Coast Cruise Parking. Hubby pulled in and the rest is history! Everyone deserves a huge THANK you for making sure we were on time for our flight. So, so happy we chose to park our car in the Gold Coast Cruise Parking lot! Everything was better than what we expected. Highly recommend checking these guys out. I wasn't able to find the lot that I had originally made a reservation for when I came to Gold Coast Cruise Parking. They were great and helped me right away. They turned what was a stressful situation into something far from it. Thanks so much for helping me out when I really needed it! Last week I had a last minute flight and in a panic didn't know where I was going to park my car and then I found Gold Coast Cruise Parking online and couldn't have been happier. Everyone treated me great and really took care of me. Everytime I travel I am a messy ball of nerves. Gold Coast Cruise Parking FLL helped to put some of those at bay with the stellar service and the awesome staff! Thanks guys for everything! CHEAP, CHEAP, CHEAP! In case you didn't get it, Gold Coast Cruise Parking FLL is cheap and offers the best rates by far. It's close to the port too which was also very helpful. Gold Coast Cruise Parking FLL is on an easy to find corner lot! the entire family that runs this business is great! They care about their customers and don't just treat them like faceless dollar signs. We will use them again without a second thought. Thanks so much! Amazing! The shuttle drivers were outstanding, they were professional, polite and had a great sense of humor. Gold Coast Cruise Parking FLL will get my business again for sure! Outstanding service all around from Gold Coast Cruise Parking FLL. The shuttle was quick to and from the Port Everglades cruise port. When we got back to the lot our car wouldn't start so they offered us complimentary drinks and snacks while the shuttle driver and one of the lot attendants jumped the car for us. What a fantastic experience! Every one of the staffers were nice and great to talk to. They loaded and unloaded our luggage for us and took us to and brought us from the Port Everglades. Although the office was closed when we arrive home, it didn't hinder our travel at all as the shuttle driver to excellent care of us! I have always used a car service in the past but decided to drive to the airport this time and I'm so glad that I did! 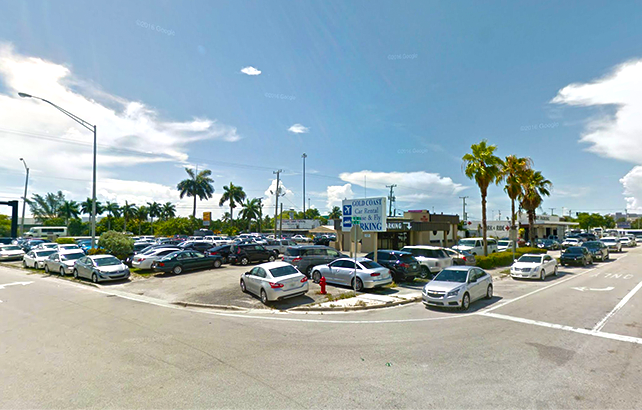 Gold Coast Cruise Parking FLL is a great company that will take good care of your car. Wow, Wow, Wow! Gold Coast Cruise Parking FLL was GREAT! This small family run business provided us with a smooth transition to the boat and then back to land and our car. Gold Coast Cruise Parking FLL is easy to find, the customer service is always professional and just awesome altogether. Excellent service. Our new go to spot to store our car when we are on a cruise. Everything was okay, nothing special but also nothing terrible. I might use them again in the future. All the staff were courteous, helpful and knowledgeable. The rates are CHEAP, CHEAP, CHEAP!!! The shuttle that will run you to the cruise port is either waiting for you or will be along within a few minutes. Gold Coast Cruise Parking FLL is a great company to work with! It's clear right from the start that this family owned business cares about their clients and will go above and beyond to make sure that they are all taken care of as if the customer themselves are part of the Gold Coast Cruise Parking FLL family. Strongly recommend. I've used Gold Coast Cruise Parking FLL for parking while on vacation and will continue using it in the future. Quick service to airport and pick up from the airport. I will use Gold Coast Cruise Parking FLL again the next vacation I take. The manager on duty was very organized and made sure that each guest was happy at Gold Coast Cruise Parking FLL. This is by far the best place to park and the price is amazing! Far better than parking at the port itself and paying the high fees there! Gold Coast Cruise Parking FLL is close to both Port Everglades and to the Ft. Lauderdale - Hollywood International Airport. Great rates too! There's no lot that offers more convenience than Gold Coast Cruise Parking FLL. It's simply just plain wonderful, with fast, friendly and efficient staff who want to where they are and appreciate you the customer. There's no need to park anywhere other than Gold Coast Cruise Parking FLL. This is the cheapest and best service you'll get near the airport. Gold Coast Cruise Parking FLL is a great parking lot that is well lit and safe for my car. I felt 100% comfortable leaving my car there. We will always use Gold Coast Cruise Parking FLL in the future. They treat us like we are family! Now our go to for parking while we are away. My family and I used Gold Coast Cruise Parking FLL last week when we went on vacation. We had never used them before but plan to continue to use them in the future. Drivers were great! Front desk staff was great! The parking lot was great! We will use this facility again soon! This is the best off-airport service I've used yet! It's so cheap that I wonder why I ever parked at the airport before. Plus the shuttle drives loads and unloads your luggage for you but at the airport, you have to do it yourself. Why haven't I parked away from the airport before?! This is the BEST service I've ever had from a long term parking lot! Awesome people that work there and awesome location too! Thanks guys! This is the best long-term parking lot that I have found yet. Everyone that works there is great and very helpful. We had no problems finding the lot and getting our car dropped off. The paperwork was quick too because I had already registered online. This was absolutely stress-free and I would use Gold Coast Cruise Parking FLL again in a heartbeat. I've been parking here for quite some time now since I found Gold Coast Cruise Parking FLL quite by accident when I was about to park at the airport. This lot is GREAT! It's cheap, the staff are wonderful and it's close to both the cruise port and the airport. Awesome find! Excellent service friendly staff and vans were clean and picked us up in a timely fashion. Easy to find. No waiting, no problems. They had my car ready, everything was ok, no new dents or damage, I even lost my ticket & they still knew exactly what car was mine & no hassles about the lost ticket!!! Kudos to this fine & friendly staff!! No complaints here! The service here was amazing and I couldn't have asked for a better experience honestly! Been telling everyone about this lot and to park here if they need to. I had a good experience and just want other people to have the same thing! Lot was cleaner than I think I expected! Great place to park! GREAT service for a GREAT price! From the moment I pulled up to Gold Coast Cruise Parking I knew this was going to be one of my better experience with parking lots, since I've had so many bad ones in the past. I was immediately greeted by an attendant who showed me where I could park without any problems. From there, they were nice enough to help me get my bags out of my car. They then let me know that the shuttle bus is available at any time of the day, but that we had to call in order for it to come get me so the attendant did that for me and just a few short minutes later, the shuttle bus showed up. Both the attendant and the driver helped me load all of my luggage in without any problems, any fuss or any complaints. I got onto the shuttle bus and the driver was super nice. Before I really even had a chance o get comfortable, I was already at FLL. I didn't realize just how close it actually was! Overall I had a really great experience and this is somewhere I would park again in the future. I've been telling everyone I know to park here when they fly out. Great job! So happy the shuttle bus was so fast! :) some other ones make extra stops and it makes the trip longer but this one was straight to where I had to go. Awesome! I was worried that checking in would take long and waste time but it was quick, simple and efficient - just the way I like it. Gold Coast Cruise Parking is so close to the cruise port it's crazy! I was there in like than 5 minutes after I got on the shuttle! Having to factor in the price of parking into my trip made me want to scream, because all the other locations I was seeing were so much money like $20 and things like that. So stumbling across this place was like a miracle! Because one of the days was over New Years it was a little more expensive because of the holiday but other than that it was great. No complaints here! Was a little worried at first because the lot was kind of.. small but it was great! :) That probably just made it easier to keep track of all the cars including mine anyway. Felt safe to me. Staff was super nice! Asked a million questions and they answered them all for me! I was a little confused by how it all worked at first, I thought there would be valet, I thought it might be a bit bigger and just a lot of things so I asked a lot of questions. I was worried about being annoying but the staff made me feel like asking questions was totally okay and after all I needed to feel comfortable leaving my truck there! I'm sure they're used to the barrage but the people at Gold Coast Cruise parking were exceptional in their delivery of customer service. I really have absolutely no complaints and I'm really happy I found this place and ended up parking here. By the time I went back to pick up my car, I was coming back from being out of the country for about 6 days so I was eager to jump in my car and head home. They had my truck ready outside and waiting, with the receipt for my parking stay so I could take care of it however was most convenient to me. It was that kind of service that will make sure I always come back and park here when I need to be close by. The price is pretty low considering that I could easily get to both the cruise port (I could see it close by) as well as the airport. I just had to call the shuttle bus ahead of time to let them know which one I'd be going to and they did everything to accommodate for me. It was for sure one of the better experiences I've had with any type of parking facility. I'm really glad that I found Gold Coast Cruise port parking because I knew I had to be close to the cruise port in order for me to make it on time to depart. Out of all of the driving and taxi options, this was the one I knew would ensure I would make it on time. I was actually there with lots of time to spare! The lot was extremely clean! You could tell that even though the location is small, they take pride in it and it's probably one of the cleanest places I've parked in Fort Lauderdale to be honest. The people that work at Gold Coast Cruise port parking are some of the nicest people I've had to deal with and I've parked at quite a few of these kinds of lots around the country. It was refreshing to be greeted with people who love their job enough to really help you out and make sure you're settled and situated and start your trip off on the right foot. Once I got my car parked where it needed to go and got my luggage out, I was whisked onto this pretty big shuttle bus to make it to the airport in a good timeframe. I was really happy and excited to be getting to my destination so I sat back a bit and before I knew it I was all over! Shuttle bus ride was super quick that's how close we were to the airport! The driver was really friendly too. Very good experience- reasonable price, great location and personable and friendly staff! I was so glad to see that this parking lot wasn't as expensive as some of the other ones I'd seen. I knew I didn't want to pay $20 a day just to leave my car somewhere! So Gold Coast was a really good deal for the price that I paid and I'd definitely park here again. The lot was really bright when I got there and just set up really well so it was easy to find and easy to get in. I always think parking lots and garages will be super dirty automatically so I was glad to see this place wasn't! Felt really good about leaving my car here and when it was all said and done I came back go find my car just the way I left it. All of this so close to FLL for $8? Seemed too good to be true but it's a great deal! SO many of the other lots around the area were way more expensive so I was really glad to have found this one so fast and so quickly. Getting around Ft. Lauderdale can be tricky sometimes but this place was really easy to find so I was glad for that. I was able to pull up right off the highway and locate the lot knowing that was in such close proximity to the air - so I just used that as my guide which ended up being a good strategy! Really don't have anything bad to say and I would most definitely park here another time. A while back I had a bad experience with my car getting broken into in one of these lots so I was really wary about this one. I pulled up and immediately started asking a log of questions. I picked this lot specifically because it was on the smaller side so I figured it would be easier to watch over. I knew they had security but I still had to be sure and the attendant was really nice and helpful in letting me know about all the safety measures they went through in order to make sure everything was safe. I felt really good about leaving my car there and was able to leave for a month without having to worry about anything at all. I'd definitely park here again in the future. I was surprised by how close the cruise port was to Gold Coast! I parked my car and was on the shuttle bus for not even 10 minutes! Got there a little late bit they were still really accommodating and helpful so it was all good. Staff at Gold Coast parking lot are really great at what they do! I was super close to the cruise port which is obviously important when that's where you're going. The shuttle service was on demand so when though our cruise left at a pretty strange time, I was still able to get over there which I was worried about. Perfect sized lot! I booked pretty early so I didn't have to worry about space running out. GREAT price! Worth the money for sure and I'm definitely parking here again. The lot size itself is small but what they lack in size they make up for in service and heart! I didn't worry not once about where my car was, how it was doing - or any of that. Everyone was so helpful to me when I got there! Good customer service makes such a huge difference between a good and great experience!! Lot was great and the staff was AWESOME. Really a great experience overall. When I came to get my car they had it all ready for me to get so I knew I chose a great lot to park at. NONE of the other ones have ever done that for me before! REALLY GREAT PRICE! I am for sure parking here again. The staff at Gold Coast made everything run so smooth and seamless, I really didn't have anything to complain about. They let me know right away how everything was going to work so I almost didn't have to ask any questions. It was awesome and I'm coming back here to park next time too. I was worried at first about how secure my car was going to be while it was here but I saw how safe it was and I was fine after that. Came to my car in one piece so that's something. The lot was smaller than I expected but you can tell it's been well maintained. It's clean, it doesn't smell or look dingy at all so I was really glad for that. Little things like that count for a lot. The booking process was so much simpler than I thought it would be! Just had to put in my check in and check put dates and I was good to go. Super easy. The staff was so friendly and helpful I was really pleased with that. Happy that everyone here seemed eager and ready to help me when I had a million and one questions for them. It made me feel way more comfortable dropping off and leaving my truck here for two weeks. I was worried because my truck is pretty big so I usually have to squeeze into a small space and the lot itself was small but I had nothing to worry about. This lot is so close to the airport you can basically see the front door! So close! I was over there in minutes it didn't take log at all. Awesome service at this lot! Shuttle bus service was even great so no complaints. Good work all around from these guys I was really pleased. There's quite a few airport parking lots in the area and this is one of the better priced ones. Most of them are like $20 day so finding this one for less than half that was really great.